How CUTE is this chalkboard table with its mismatched chairs?! I'm pretty excited about it! The story begins with a crazy good deal found at Pickin Time on 59. (You've heard me talk about Pickin' Time on 59 HERE and HERE.) Attending has become a family tradition! This sturdy little table and all four chairs were only $10! TOTAL SCORE!! 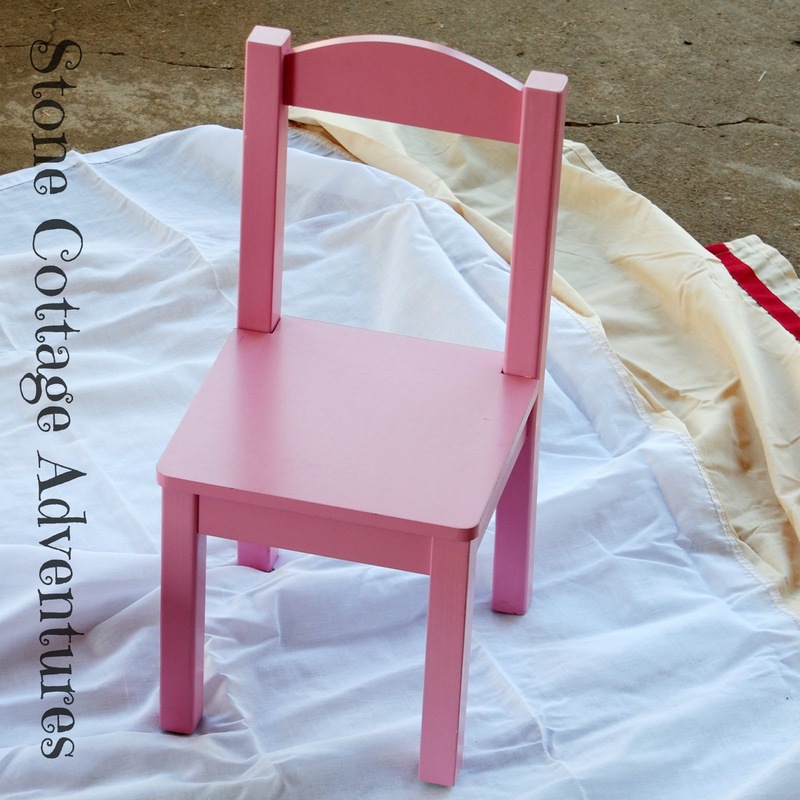 As we were loading, the gal selling it told me she had purchased this adorable furniture for her daughter, ordering all four chairs in pink. Upon arrival, one chair was yellow. She called, and the company was very accommodating. They promised to send a pink one right away. She shipped back the yellow chair, but received a blue chair! ;-) At that point, she just accepted one mismatch. Structurally, everything is fine, but, it's kid's stuff, so there are some stains, scratches and dings. Two of the chairs are actually near perfect, but two others and that table top need a bit of paint. My wonderful Aunt Margie donated some soft yellow paint to the cause and I had some chalkboard paint leftover from the kitchen remodel. Handsome Husband always has white paint laying around for something or another. I feel like all my supplies were "free" since they weren't purchased specifically for this project. The plan is for the top of the table to be black and the legs to be white. I am a seriously wild painter, so taping is pretty important around here! ;-) Here's a tip: Old dust ruffles from the linen closet make great drop cloths, which creates more space in the linen closet. Win! For the table top, I taped around the edge and then taped on a dust ruffle. Even with all that taping, you can see a smudge of black paint that had to be touched up. Ever helpful, Kati Cat was right there with me offering advice and getting her tail in the way! ;-) I'm pretty sure she does that tail thing on purpose! After one afternoon of taping and painting, we have a charming little table set! What bargains have you been scoring lately? Been awhile since I scored any goodies, haven't been to thrift stores for few weeks. 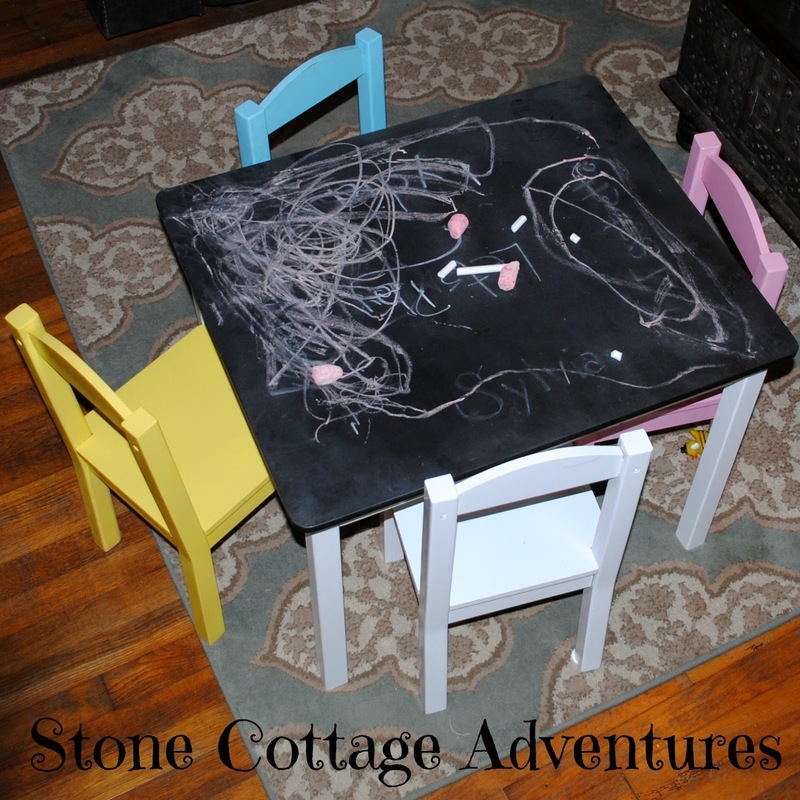 Your little table and chairs are such a gem, you fixed them up perfectly, sure kids enjoyed chalk board top to practice their artistry. There have been months with 5 weeks and we didn't get SS til 3 days after Christmas so no money to buy, why go? Consequently am chomping at bit to hit all my favorites. Wanted to go today but it snowed for hours and since our tires aren't the best right now figured we'd better stay cozy at home. Got up this morning to bit of snow on ground already. This is so cute and what a find! This would be a perfect idea for my 3 littlest grandkids. Thanks for sharing your clever idea! What a fun idea! (although I want to see everyone's sleeves/arms when they're done) ;) I love all the colors, too! This is adorable! What a fun idea for small kids. 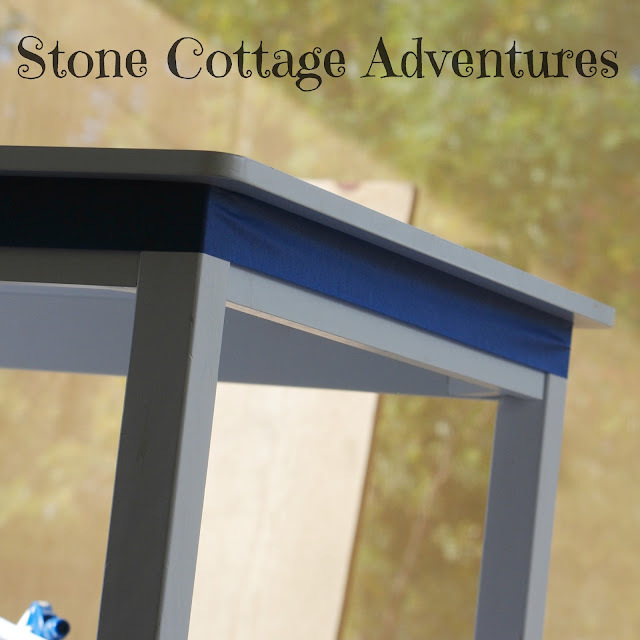 I especially love the paint chalk on the top of the table! What a great for $10! I love the chalkboard top. It looks terrific, Marci. Thanks for sharing with us at Snickerdoodle. That is just darling! I love the colors and that the top allows the kiddos to draw now. Turning your tabletop into a chalkboard was truly a really clever idea. I want to be a kid and sit and draw at that table!! Very clever transformation. Thank you for linking with us at #HomeMattersParty . We would love to see you again next week. I love this idea...I may have to do this to my kid's table :-) Thanks for sharing. 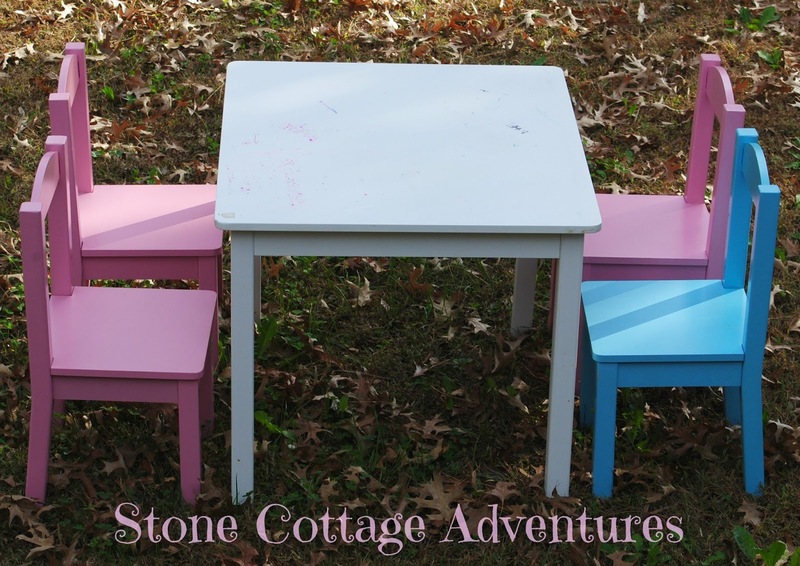 This is such a beautiful and fun kids table makeover! I would love to sit at it and draw away! 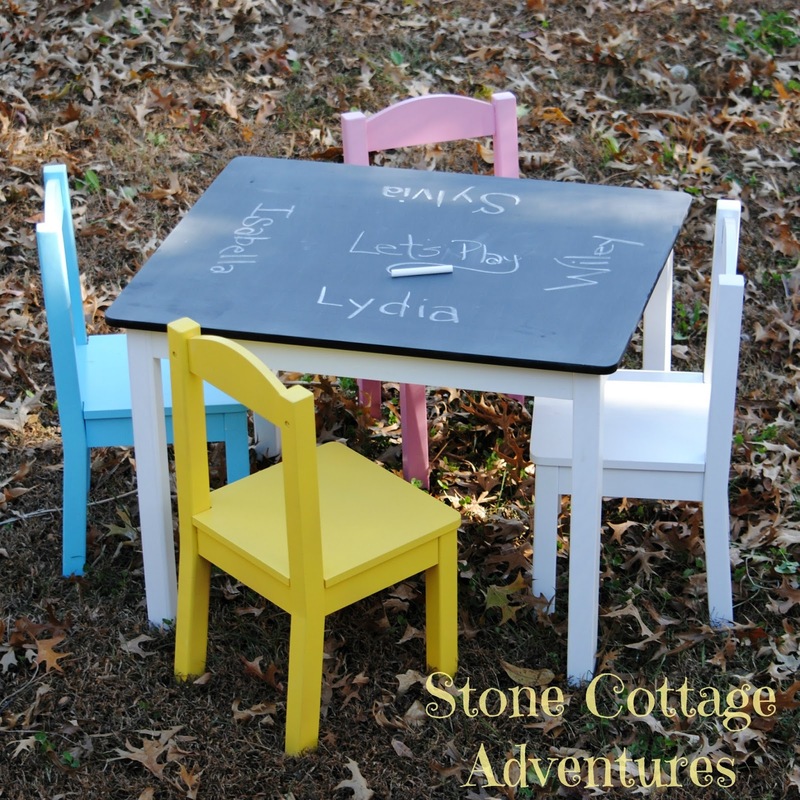 What a great idea to make the top of the table into a blackboard (chalk board)! This is a gorgeous little makeover. 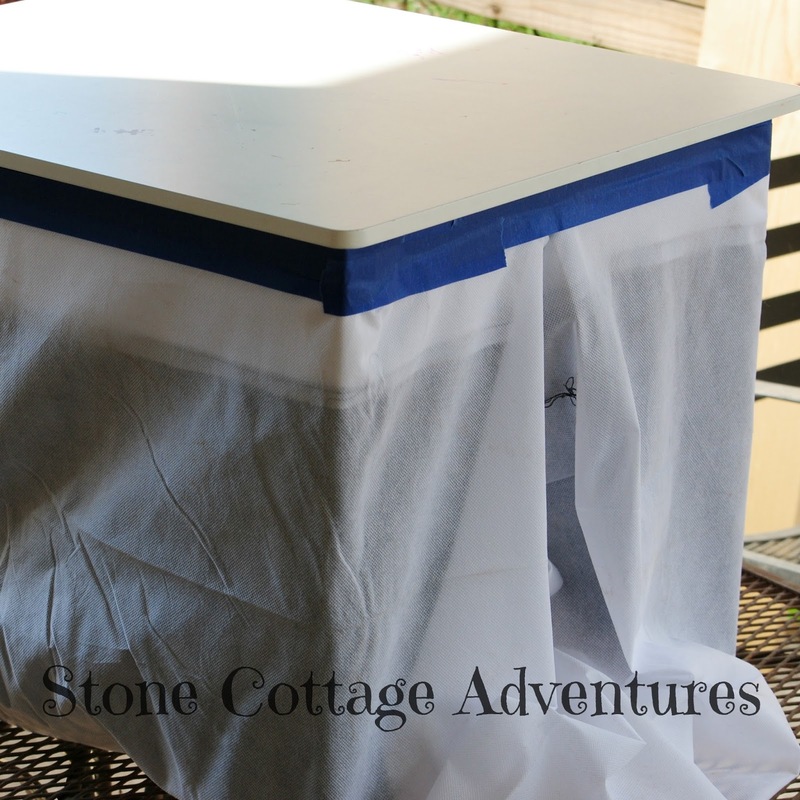 The chalkboard top is perfect for munchkins. I chucked with the cat picture, because my dog is always involved in my projects as well. Congrats on having a go to place for a good deal. They are very hard to find. Enjoy your week Marci. 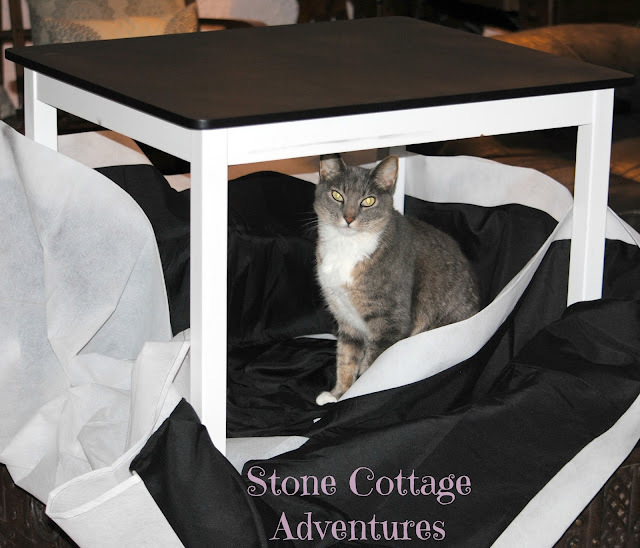 What a brilliant idea for the table Marci - my daughter's would have loved this ! !